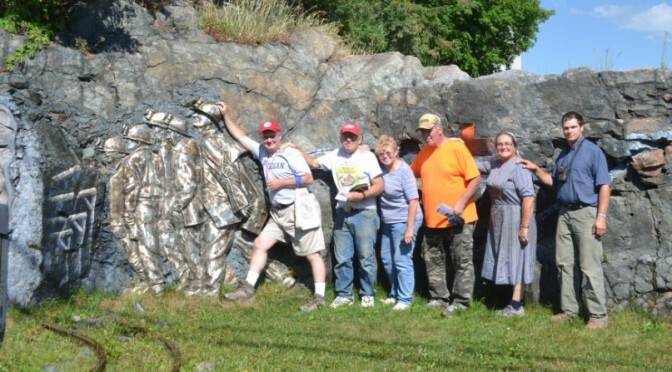 This is an experiment in uploading the complete Wayne County Gem and Mineral Club Newsletter to my site. Click on the green link below and you should find the newsletter. Several of the articles are also entered as separate posts. 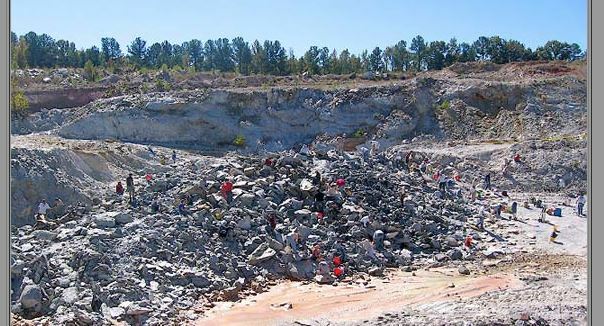 In the July issue of WCGMC News, one of the club’s long time members offers his memories of a favorite site and a favorite mineral. Ken Rowe, and his wife Rocky, have been club members for over 30 years. This is a brief reminiscence about my collecting at the Gouverneur Talc Mine and the Zinc Corporation of America Mine in Balmat, New York in the late 1980’s. We began about 1980, when my wife and I were fairly new members of the WCGM Club. We were guided by Jim and Marion Wheaton, the founding members of WCGMC. 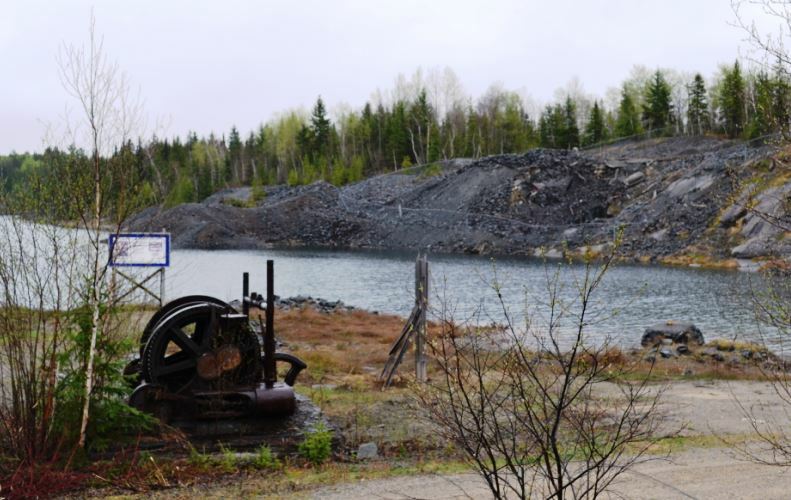 At that time the Balmat site was an underground mine for zinc. I have a confession to make. Yes, I admit it, for the first few decades of my adult life I collected minerals while scoffing at the notion of cutting rocks and polishing their surface to produce symmetric reflective surfaces. Cabochons, smabochons, … spheres, smears, I would say, or something to that effect. Well, since joining the Wayne County Gem and Mineral Club I have come to realize that some rocks, even some minerals, are best displayed and enjoyed after they have been carved, sliced, ground, and polished. What is more, that process can be fun and there is art involved in the creation of a polished stone. I am not a total convert, I still cherish and generally prefer natural crystalline specimens, preferably on matrix and often in association with other minerals, but I am now capable of collecting, and yes even, horrors, purchasing a polished cabochon. OK, with that admission of past guilt, or new guilt depending on your persuasion, I decided to peruse the GemFest floor for particularly interesting pieces that had been butchered by a saw and then beautified by some process of trimming and polishing. I found several that caught my fancy. But I must warn you, beauty, color, and symmetry are not enough. The rock or mineral must tell an interesting geologic story and just like a classic mineral specimen it must have a provenance, a banded agate from somewhere just won’t make my short list no matter how beautiful it might be. So what did I find? Pennsylvania and the Limestone Products Quarries in Mt. Pleasant Mills and Middlebury beckoned a number of Wayne County Gem and Mineral Club collectors south for May Day. 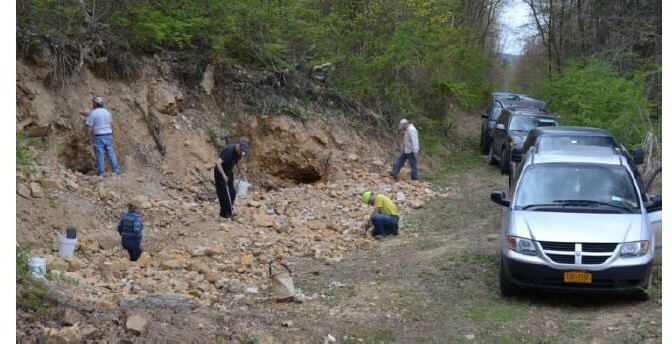 The day started with the annual dig atop the quarry collecting wavellite. As the cover photo suggests, we dug high, low, left, and right in the third cut atop the hill, but unfortunately we were not as successful as in past years. Lots of color but not many full balls and none of the deep green the Buffalo Club had on display at its show in March. We probably did not dig deeply enough to deserve quality pieces. But, yes, that is Jerry Donahue in the middle of the photo with his sampling tool. It was great to see him back in the field with us. Spring has arrived and Wayne County Gem and Mineral Club did not let any grass grow under its feet before activating its field season. In fact, we did not even let the snow melt. It was April, it was opening day, and there were diamonds involved. But no, it was not baseball. 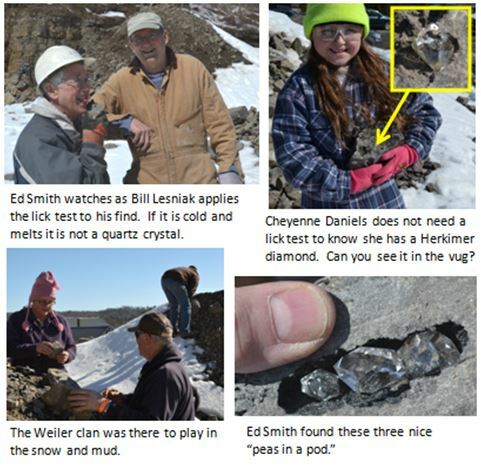 Rather, April 1 is opening day for “Herkimer diamond” hunting at Ace of Diamonds Mine in Middleville, NY and 12 intrepid WCGMC members put on their boots and their woolies and made the annual trip. 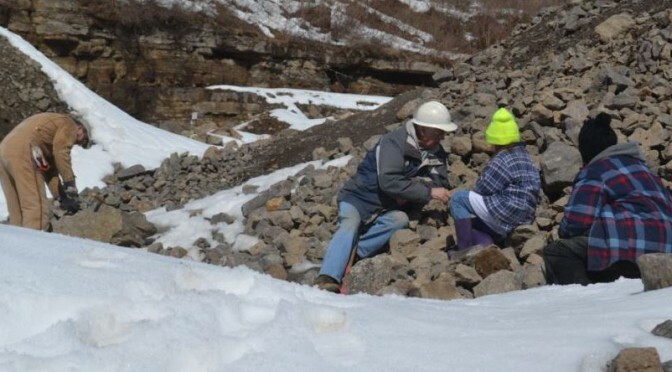 Exposure was limited and the snow prevented the owners from bringing in new rock. But there were still “diamonds” to be found and the sun was out to warm our hearts if not our hands. April 1 may actually be more tolerable than August 1. We even signed up a new member while digging, welcoming Donna Dow to our growing family of crazed collectors. 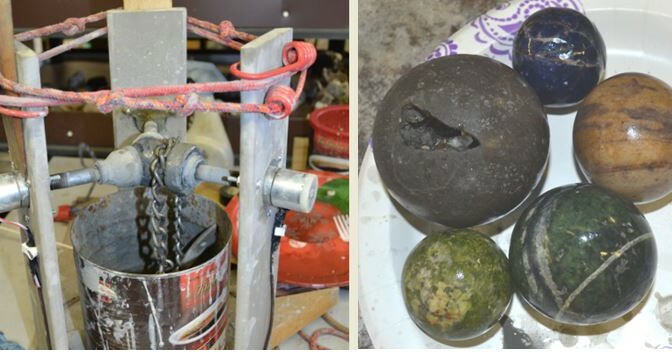 Those of us who visited the Rochester Lapidary workshop for an open house in March were both fascinated and impressed by their pair of sphere making machines. But while most of us went home wishing we had one, Glenn Weiler went home and actually built one! When we all arrived on April 11th for our monthly workshop Glenn was working on his fifth sphere. While he admits the “contraption” needs a few design improvements before achieving perfection, Glenn’s ingenuity was once again demonstrated. Below is a picture of the machine and his first five products. The small blue sodalite sphere at the top is gorgeous. The layered orange sphere looks like Jupiter to me, except it is not made of gas! Glenn will have a complete Solar System soon. And can you see the Herkimer diamond at the right end of the vug in the largest sphere? Since the days of the Roman Empire, purple has been the color of royalty. As a combination of red and blue, purple is not a spectral color and therefore lacks a defining spectral wavelength. However, that has not prevented people from claiming purple to be their absolutely favorite color. Women build their wardrobes around their purple dresses, folks paint their bedrooms purple, gardeners plan their seasonal blooms from tulips to irises to petunias, and yes mineral collectors must have plenty of purple in their displays. Fortunately they have some wonderfully gorgeous minerals from which to choose. March 13th was Purple Mineral Night for the Wayne County Club. 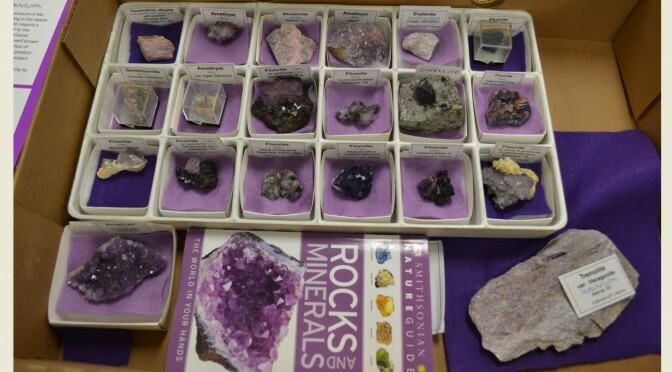 Members brought in their purple minerals and we all drooled over them. Naturally there was lots of amethyst in attendance. Simple clear quartz (SiO2) is colored to various shades of purple when small amounts (< 20 ppm) of iron (Fe) replace Si when the quartz is naturally exposed to ionizing irradiation. The smaller iron atom leads to lattice distortions that effect light passage imparting the color variation. With a hardness of 7, amethyst makes a wonderful gemstone as well as a colorful mineral specimen. The month’s site article is leaving New York again and is headed for the Piedmont region of North Carolina. No, not because it is necessarily warmer there, although it probably is, but because I am the editor and I decided it would. But seriously, who doesn’t like pyrite cubes and when I discovered some in a bucket in the Weiler’s barn/club workshop last month I asked where they were collected. Turns out they came from the Standard Mineral Company Mine in Glendon, North Carolina. WCGMC had ventured south on at least two occasions (2009 and 2010) to dig pyrite on trips organized by the Mountain Area Gem and Mineral Association (M.A.G.M.A.) of North Carolina. It sounded like an excellent opportunity to revisit some club history. And then I got really lucky. A visit to the M.A.G.M.A. website yielded photographs from those trips and bingo there was Bill Chapman in his orange collecting uniform holding up a 2” pyrite cube for all to see. The gentleman just behind his right shoulder is Bill Lesniak. I considered this is clear proof that they had actually made the trip south and I set off to learn something about the mine. 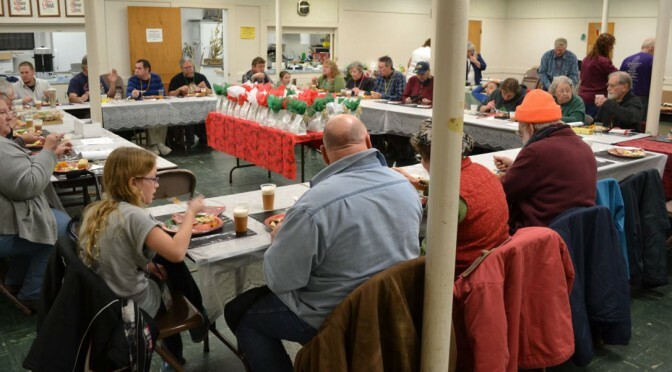 On December 13th, 17 Wayne County Gem and Mineral Club members convened for a day of sawing, polishing, faceting and camaraderie. The event marked the inaugural session in the club’s newly christened workshop. 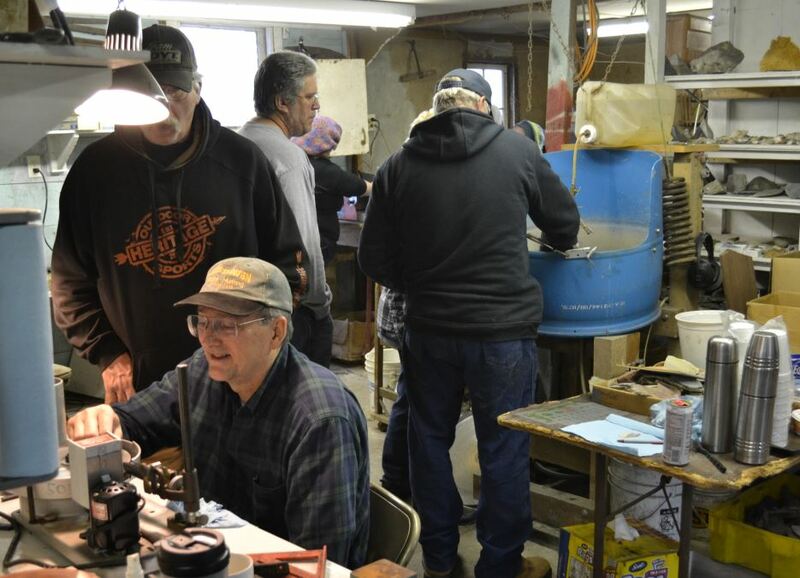 With several saws, three polishing machines, and a faceting machine the fun commenced. 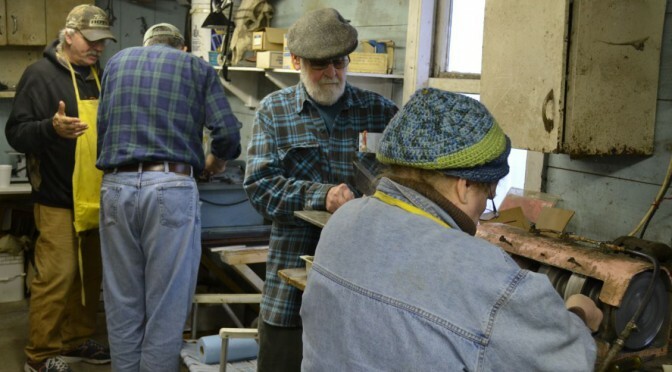 The cover photo shows Gary, Ed, Ken, and Sue working on their rocks. Although we have not yet seen any white stuff in the air, or even had a frost in most of our region, it appears it is time to announce the closure of our field season and start thinking about next year. Our trips in 2014 are listed on the webpage, but for a quick summary, how about these numbers! We participated as a club in 21 field events between late March and mid-October. Eight trips were weekend or multi-day trips involving overnight stays (with two campouts). 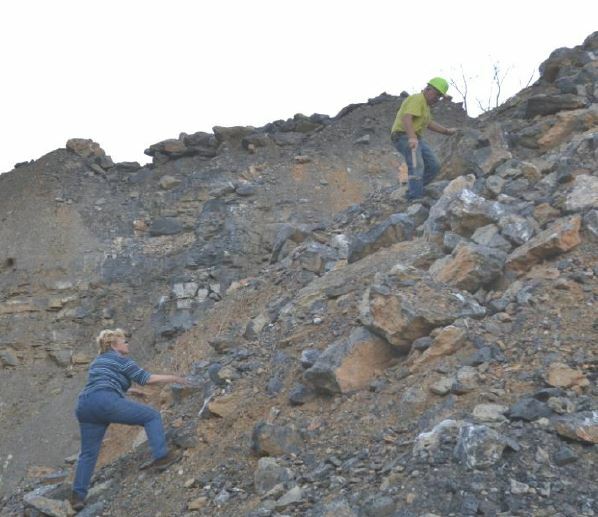 Although the majority was in search of minerals, we had 7 trips targeting fossils. We ventured to St. Lawrence County 5 times and to Ontario, Canada twice. Several folks led individual trips this year, but our Field Trip Leader, Bill Chapman, planned and ran most of them. Many thanks to Bill for a wonderful field season. As for 2015, we have some ideas of new places to go and we will return to many of this year’s sites, but we would love to hear from you where you would like to go. Anyone can lead a trip! 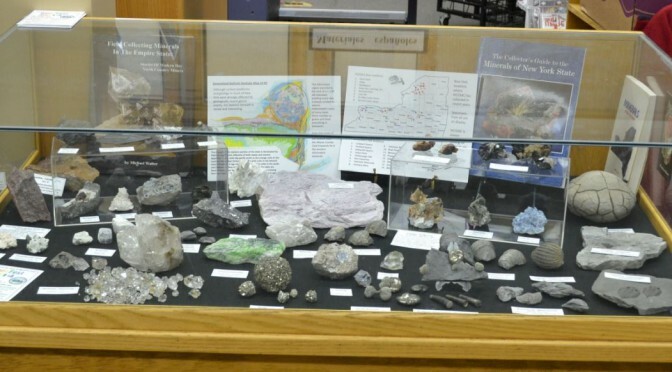 The Wayne County Gem and Mineral Club Show Committee is pleased to announce that next spring’s big show will be held June 6th-7th at the Greater Canandaigua Civic Center just north of Canandaigua city center off route 332. Previous shows had been held in Newark that same first full weekend in June. The new facility at 250 N. Broomfield Road features a hockey/skating rink in the winter, but the ice is taken up in April and the location is available for conventions and trade shows in the spring and summer. 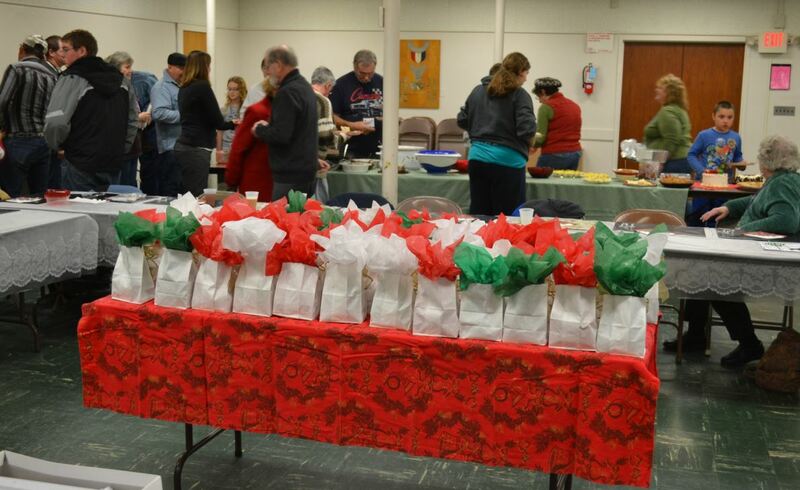 The setting will provide us with much more space, improved lighting, better parking, and full snack/food service. We are excited about the move and will have more details as the date approaches. Dealers interested in joining us can contact Pat Chapman (607-868-4649). Pick up your skates and head over some time this winter to check out the new venue. Over 30 club members enjoyed an afternoon of fun together at Glenn and Eva Jane Weiler’s home in Wolcott. Mineral collecting stories and other tall tales were swapped and many minerals had to be cleared from the tables to allow for the pot luck dinner to proceed. Thanks to Dave Millis a number of mineral craft activities were available for those interested; wire screens were constructed, rock saws were in action, geodes were opened, and mineral raffles were held. “Barrel” rides were available for folks of all ages. July has just ended and the field collecting season is about half over. Can you count the number of collecting trips the Wayne County Gem and Mineral Club has conducted or attended so far in 2014? Hint: you will need your toes. If you visit our webpage (wcgmc.org) and link to the calendar page you can count them. In the first seven months of 2014 (and we did not start until late March) our club has taken part in 15 digs! 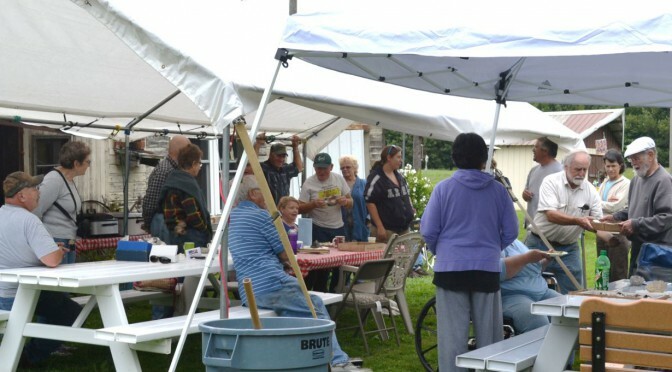 We did not plan every one of them: the Penn-Dixie Expert Dig, the Penfield Open House, and the Sterling Hills Super Dig were outside functions. 1) I resolve to attend as many rock, mineral, and fossil collecting trips with WCGMC as possible (that should be easy to keep). 2. I resolve to clean up, organize, and label specimens from each trip before the next trip (now that would be a first for me). 3. I resolve to lose 15 pounds during next year’s gardening and collecting season (I manage to do this most years). 4. I resolve not to gain those pounds back during the hibernating/eating season that follows the summer (trouble is I fail this every year such that resolution #3 becomes necessary every year). Maybe we should share resolutions at an upcoming club meeting? Or the next time we are in the field. Our fearless trip leader, Bill Chapman, tells us that one early trip will be April 1 with a visit to Ace of Diamonds in Herkimer. 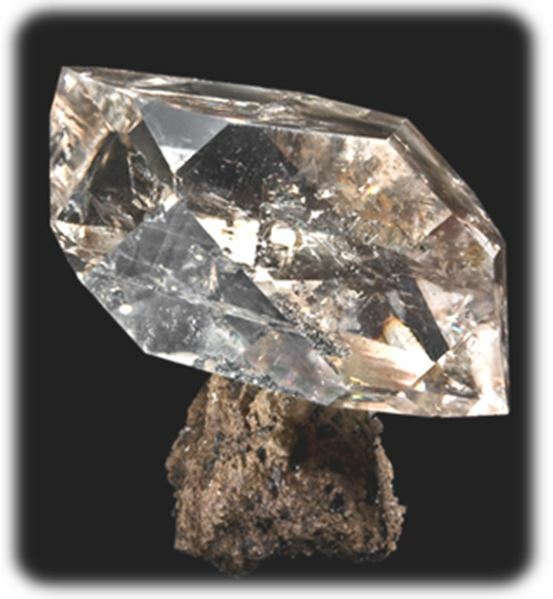 I guess that is as fitting a day as any for folks with our hobby to be “hunting diamonds.” Most of you are well acquainted with digging in the Cambrian dolostones of Herkimer County. For me this will be a new treat. I have been there once, but decades ago and only briefly. I’ll be looking for a few 3 inch crystals on matrix that look like this !